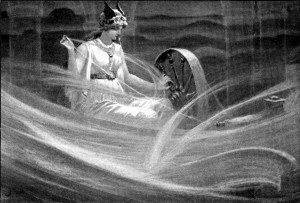 Frigg (pronounced “FRIG;” Old Norse Frigg, “Beloved”), sometimes Anglicized as “Frigga,” is the highest-ranking of the Aesir goddesses. She’s the wife of Odin, the leader of the gods, and the mother of Baldur. Strangely for a goddess of her high position, the surviving primary sources on Norse mythology give only sparse and casual accounts of anything related to her personality, deeds, or other attributes. The specifics they do discuss, however, are not unique to Frigg, but are instead shared by both her and Freya, a goddess who belongs to both the Aesir and the Vanir tribes of deities. From these similarities, combined with the two goddesses’ mutual evolution from the earlier Germanic goddess Frija, we can see that Frigg and Freya were only nominally distinct figures by the late Viking Age, when our sources were recorded, and that these two figures, who had formerly been the same deity, were still practically the same personage in everything but name. Like Freya, Frigg is depicted as a völva, a Viking Age practitioner of the form of Norse magic known as seidr. Seidr involved discerning the course of fate and working within its structure to bring about change, often by symbolically weaving new events into being. This power could potentially be put to any use imaginable, and examples that cover virtually the entire range of the human condition can be found in Old Norse literature. In the Old Norse poem Lokasenna, after Loki slanders Frigg, Freya warns him that Frigg knows the fate of all beings, an intimation of her ability to perform seidr. Frigg’s weaving activities are likely an allusion to this role as well. Freya owns falcon plumes that she and the other Aesir use for shapeshifting into that bird, and Frigg possesses her own set of falcon feathers that are used for the same purpose. During the so-called Völkerwanderung or “Migration Period” – roughly 400-800 CE, and thus the period that immediately preceded the Viking Age – the figure who would later become the völva held a much more institutionally necessary and universally acclaimed role among the Germanic tribes. One of the core societal institutions of the period was the warband, a tightly organized military society presided over by a chieftain and his wife. The wife of the warband’s leader, according to the Roman historian Tacitus, held the title of veleda, and her role in the warband was to foretell the outcome of a suggested plan of action by means of divination and to influence that outcome by means of more active magic, as well as to serve a special cup of liquor that was a powerful symbol of both temporal and spiritual power in the warband’s periodic ritual feasts. This “politico-theological conception” was based on the mythological model provided by the divine pair Frija and Woðanaz, deities who later evolved into, respectively, Freya/Frigg and Odin. Woðanaz is the warband’s chieftain, and Frija is its veleda. Thus, in the Migration Period, the goddess who later became Freya (and Frigg) was the wife of the god who later became Odin. While somewhat veiled, this is ultimately still the case in Old Norse literature. Freya’s husband is named Óðr, a name which is virtually identical to that of Óðinn (the Old Norse form of “Odin”). Óðr means “ecstasy, inspiration, furor.” Óðinn is simply the word óðr with the masculine definite article (-inn) added onto the end. The two names come from the same word and have the same meaning. Óðr is an obscure and seldom-mentioned character in Old Norse literature. The one passage that tells us anything about his personality or deeds – anything beyond merely listing his name in connection with Freya – comes from the Prose Edda, which states that Óðr is often away on long journeys, and that Freya can often be found weeping tears of red gold over his absence. Many of the surviving tales involving Odin have him traveling far and wide throughout the Nine Worlds, to the point that he’s probably more often away from Asgard than within it. Many of Odin’s numerous bynames allude to his wanderings or are names he assumed to disguise his identity while abroad. Thus, it’s hard to see Freya’s husband as anything but an only nominally distinct extension of Odin. The names of the two goddesses are also particularly interesting in this regard. Freyja, “Lady,” is a title rather than a true name. It’s a cognate of the modern German word Frau, which is used in much the same way as the English title “Mrs.” In the Viking Age, Scandinavian and Icelandic aristocratic women were sometimes called freyjur, the plural of freyja. “Frigg,” meanwhile, comes from an ancient root that means “beloved.” Frigg’s name therefore links her to love and desire, precisely the areas of life over which Freya presides. Here again we can discern the ultimate reducibility of both goddesses to one another: one’s name is identical to the other’s attributes, and the other name is a generic title rather than a unique name. Clearly, then, the two are ultimately the same goddess. Why, then, are they presented as nominally distinct in the late Old Norse sources? Unfortunately, no one really knows. Orel, Vladimir. 2003. A Handbook of Germanic Etymology. p. 114. Heide, Eldar. 2006. Spinning Seiðr. In Old Norse Religion in Long-Term Perspectives: Origins, Changes and Interactions. Edited by Anders Andrén, Kristina Jennbert, and Catharina Raudvere. p. 166. The Poetic Edda. Lokasenna, verse 29. Snorri Sturluson. The Prose Edda. Skáldskaparmál 18-19. Price, Neil S. 2002. The Viking Way: Religion and War in Late Iron Age Scandinavia. p. 279-328. Enright, Michael J. 1996. Lady with a Mead Cup: Ritual, Prophecy and Lordship in the European Warband from La Tène to the Viking Age. Snorri Sturluson. The Prose Edda. Gylfaginning 35. The Poetic Edda. Lokasenna, verse 26. Snorri Sturluson. Ynglinga Saga 3. In Heimskringla: eða Sögur Noregs Konunga. See, for example: Grimm, Jacob. 1882. Teutonic Mythology, Volume 1. Translated by James Steven Stallybrass. p. 302. Ellis-Davidson, Hilda Roderick. 1964. Gods and Myths of Northern Europe. p. 111. Grimm, Jacob. 1882. Teutonic Mythology, Volume 1. Translated by James Steven Stallybrass. p. 300.